The Emlid ReachRS is not your ordinary RTK GNSS receiver. With a disruptively lower price, many potential users see it as 'just too cheap' yet it is receiving favourable technical reviews the world over. Even Reigl now recommend it as the base station for one of their latest terrestrial LiDAR scanners! After testing against leading brand dual-frequency RTK products, Emlid has recently been selected by a multi-national mining company for use at it's 25+ South-East Asian mine-sites. Mangoesmapping hold multiple supplier prequalifications and are pleased to announce their recent acceptance as a member of the SA Government Agency eProjects ($700k-$4.4M) Procurement Panel and the eProjects Low Risk ICT (<$100k) Projects Panel. Mangoesmapping have been providing Geospatial and ICT consulting services to Government organisations and private companies/individuals all over Queensland, and after interest from South Australian clients we are excited to be officially extending our team into South Australia. Becoming a pre-qualified South Australian Government provider will streamline the procurement process, deliver benefits for our customers and improve supplier relations. Mangoesmapping view this advancement into South Australia as a long term commitment, and will strive to continue to inject innovation across our product and service offerings while providing reliable and exception service to new and old customers alike. Should you have any queries please contact Mangoesmapping Director Alistair Hart (alistair@mangoesmapping.com.au or 0409 885 776). Following Mangoesmapping's acceptance onto the South Australian Government eProjects Panel, we are pleased to announce we have also just been awarded a place on the Local Buy Arrangement BUS249-0515 (Business Management). Mangoesmapping can now supply Specialised Consultancy services to Councils and Local Government authorities in Queensland and the Northern Territory for the People, Performance & Change Management category, without the need for the clients to go through the tendering process. So when they require our geospatial strategic consulting services the process is now much more streamlined and efficient. Local Buy is the Local Government Association of Queensland (LGAQ) procurement services company. Local Buy’s core business is contracts: establishing common-use procurement arrangements for Councils and Local Government authorities. Have you struggled to find a mapping app that has all the features you need for a true mobile GIS, without being locked into a major GIS vendor ecosystem? Mappt is your answer! Mangoesmapping have been involved with Mappt since it's first commercial release back in 2013 and have worked with the team at Mappt to help it grow it's functionalities and user base. Mangoesmapping now offer 12 month subscriptions to Mappt and on-site end-user training. We can even help you customise your Mappt projects to fit the business requirements for your organisation. The annual Queensland Spatial Excellence Awards, part of the prestigious Asia-Pacific Spatial Excellence Awards series was held recently in Brisbane. Mangoesmapping were nominated in three categories and won the Environment and Sustainability category for our work developing a low-cost solution for monitoring sediment loss from erosion gullies in Great Barrier Reef catchments. Mangoesmapping and Emlid were also recognised in the Innovation and Commercialisation category for 'RTK for the masses' - our work bringing the disruptive and highly innovative ReachRS to Australia. Douglas Shire Council and Mangoesmapping were also highly commended in the Spatial Enablement category for our use oof low-cost spatial technology to drive financial and operational efficiencies in the contract process for commercial lawn-mowing services through the preparation of the Douglas Shire lawn-mowing tender. Mangoesmapping has joined in partnership with Maps Made Easy, offering subscription packages for government and industry, in Australian currency, with GST included and with local support. Maps Made Easy offers a very simple process to turn drone images into image mosaics and 3D data. Maps Made Easy has a strong existing user base in Australia and we highly recommend it to new users. Additionally, Maps Made Easy have an excellend iOS app for drone image data collection which supports custom mission shapes and multi-battery missions. It is our preferred app for our own drone data collection! Get in touch to learn how we can help you convert your drone photos into spatial datasets suitable for use in GIS/Mapping software! 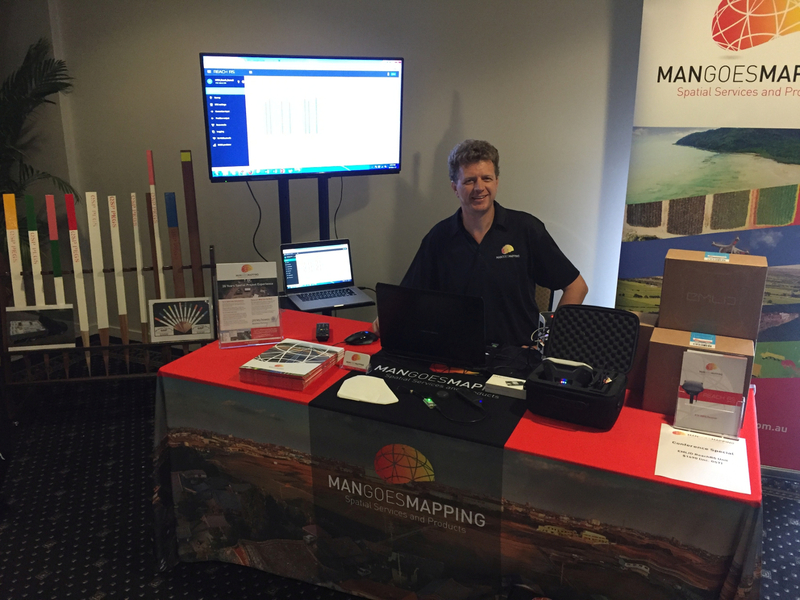 Mangoesmapping exhibited at the SSSI Northern Group Conference, promoting the powerful combination of the Hexagon Smartnet Aus CORS service combined with Emlid's single frequency, multi-constellation ReachRS RTK GNSS receiver. While we were there, we also shared our recent achievements using drones for sediment monitoring in a presentation. Mangoesmapping was proud to sponsor the annual CAFNEC Far North Queensland Wilderness Bike Tour. Navigating through the captivating landscape of Far North Queensland, the tour rides through lush rainforest, vast open spaces, winds through hills, and the landmarks of the area. The event is always a highlight of many riders. Mangoesmapping was thrilled to be the coffee cart sponsor for SA SID 2017. We also used this event for the formal launch of the Emlid ReachRS RTK GNSS Rreciever to the surveying and spatial industry, where it attracted much positive attention for it's compact size/weight and disruptively low pricing! On the 29th and 30th of June, the Mangoesmapping team headed down to the Annual 2017 FunGIS Conference held in Cairns. Exhibiting the wide range of skills, services and technologies, the team had the opportunity to demonstrate to interested attendees the effectiveness of the work undertaken. Through the constant search for a greater expectation of technological precision, Mangoesmapping was recently selected as the only Australian distributor of Emlid RTK GNSS products. Using the receivers ourselves, it's easy for us to provide first hand support to our customers, and by putting our money where our mouth is, we can guarantee a higher data acquisition quality. Trust the technology the professionals use. Here at Mangoesmapping, we believe that community is integral, and so we exhibited at the Far North Queensland Rotary Field Day. With thousands flocking from all over Queensland, Mangoesmapping was proud show the various services and products available, as well as how they may allow customers to excel in their field. From tourists and enthusiasts, to corporate farmers and musters, the Rotary Field day was an excellent opportunity for Mangoesmapping to continue support the local and extended community. Mangoesmapping were proud nominees in both the People/Community and Regional Innovator categories at the 2017 Tablelands Business Excellence Awards in Atherton on May 20th. 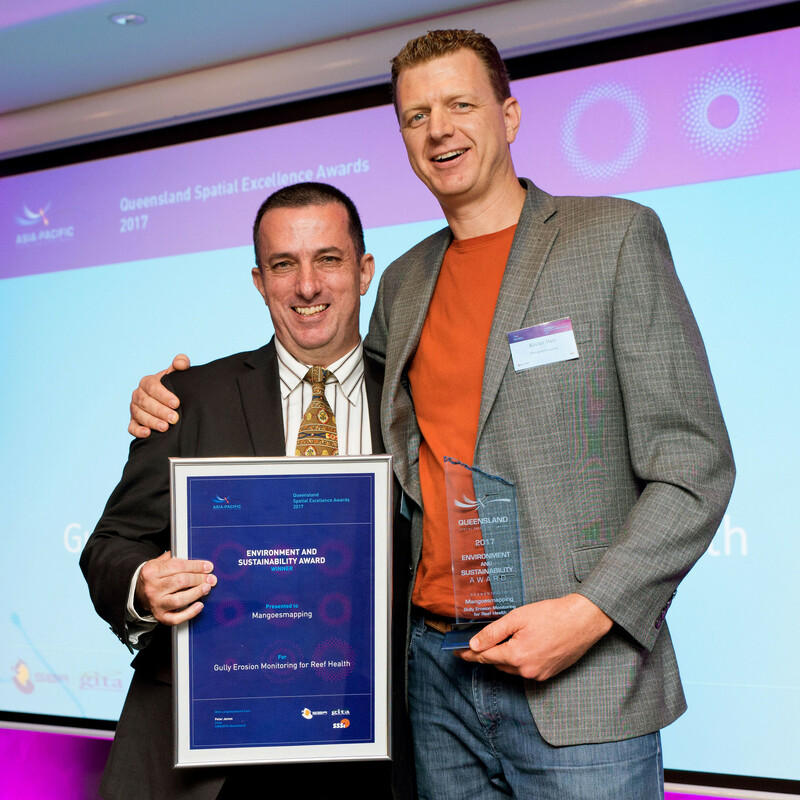 We were thrilled to be awarded the Regional Innovator award for our work developing a low cost method for monitoring sediment loss from erosion gullies in Great Barrier Reef catchments, especially with other fantastic innovators in the mix. StemX provides a space for budding entrepreneurs, high corporate successes, local governments and school kids to come together to explore the variety of developing and breakthrough technologies, and their impressions on the Science, Technology, Engineering and Mathematics (STEM) industries. 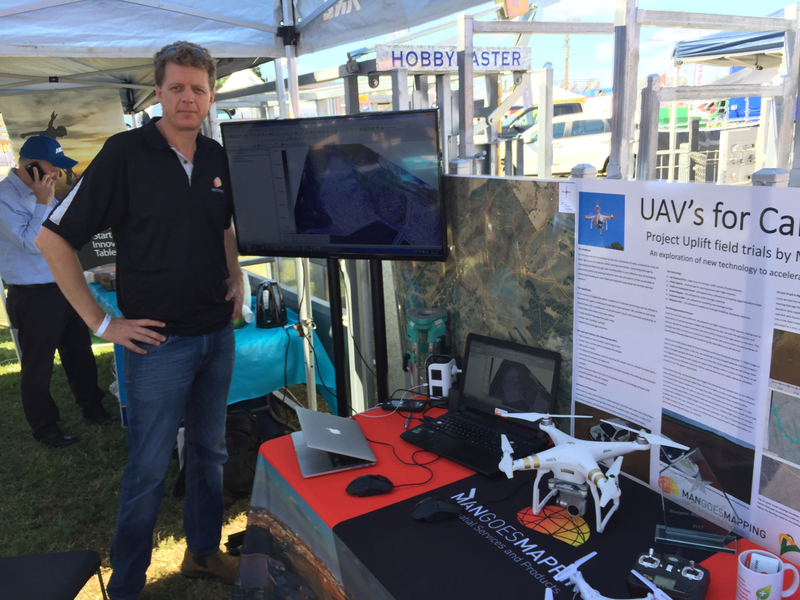 Mangoesmapping was proud to present our drones and agricultural achievements, and gained particular interest from students and GIS software giants.